Old Man Emu suspension components are perfect for those who want ride quality over 'show' quality. You may find taller or more heavily advertised suspension lifts on the market, but you will never find anything that ride more comfortably, has greater load capacity, or is more durable than Old Man Emu. 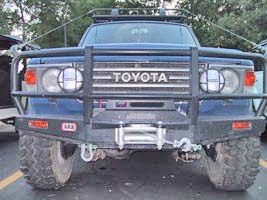 If you truly are looking for the 'best' suspension and not just the most popular or one that temporarily sits an inch taller (most lifts sag quickly, not OME), then you have found the very best suspension on the planet for your Toyota series be is the 60, 62, or diesel model Landcruiser. 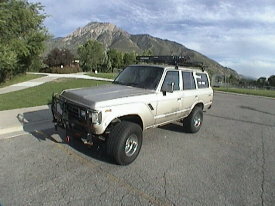 Pictured to the left is an ARB Bull Bar and Old Man Emu outfitted Cruiser. Also available from rocky Road are Safari snorkel, and Safari rack, and ARB Air Lockers! No need to look any further, Toyota Landcruiser owners know that Old Man Emu is the only suspension worthy of their vehicles. Old Man Emu / Dakar lifts are listed below. Some folks might ask why OME/Dakar suspensions are not available in taller lifts? OME/Dakar's philosophy is quality and sensibility without complications. OME/Dakar sizes their lifts such that there are no problems or modifications required to steering, braking, or drivetrain. Any taller and these items do become an issue. For most people, the extra inch or so isn't worth all the headache and cost necessary. Do it right the first time with OME/Dakar! 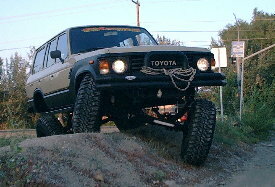 Scoll down this webpage to the lower portion for some additional information on the excellent Old Man Emu suspension lift kits for Toyota 60 Landcruisers. PLEASE NOTE: Many shops will try and undercut pricing by including inferior bushing kits... NOT Old Man Emu Bushing kits in their suspension packages. If you see a price lower than ours and notice the bushings pictured are black, its because you're getting sub-par bushings, not the highest quality Old Man Emu bushings. We ONLY use Old Man Emu bushings in our Toyota suspensions. Always be aware of this as Rocky Road does have the lowest prices anywhere for true OME suspension systems. 60 series with OME and 33" tires. Our Old Man Emu kits contain 100% OME products. We do not substitute lesser grade bushings, ubolts, shackles, or shocks. Shipping on the complete kits cannot be calculated correctly thru our website due to the extreme heavy weight of these springs, multiple packages required, and extra fees UPS adds for the odd-sized parts. The final billing for shipping will be different than what is displayed on the website. We recommend shipping to a business address to get lower shipping fees. Greg's wife surprised him with an OME suspension for his '84. 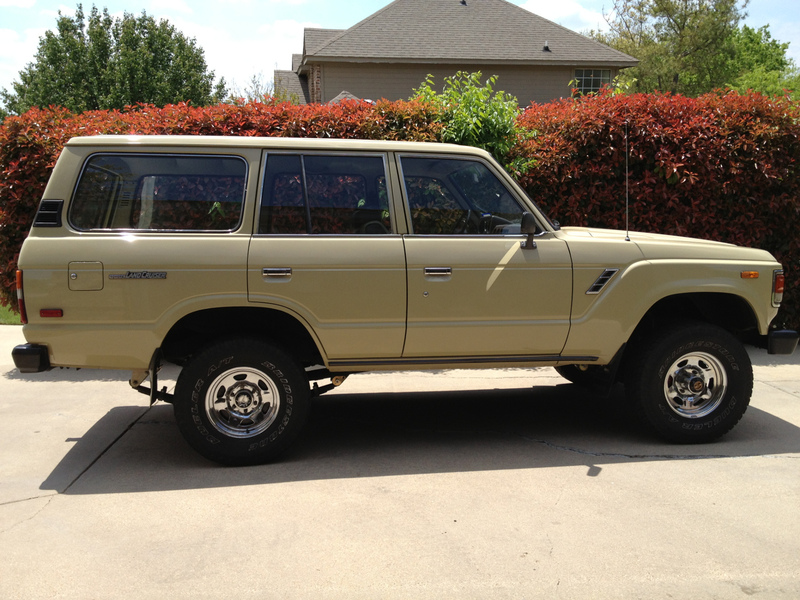 One of the cleanest FJ60s we've seen in awhile. Click on the links below to find more information on our excellent high quality parts from ARB for your Toyota. Wagon with OME springs on top of the axle! Bull Bar Photo courtesy of Hunter Arend. "I know this group (ARB) goes on and on and on about their suspension but I was a touch sceptical - why do I need to spend extra on a suspension for a $50,000 plus vehicle? But all the bucks was money well spent. If we knew the difference this (OME) upgrade would make to the truck we'd have driven it straight from the dealer to OME." This comment, taken from the internet, from a Toyota Landcruiser owner, is typical of the benefits enjoyed by customers of Old Man Emu all around the world.